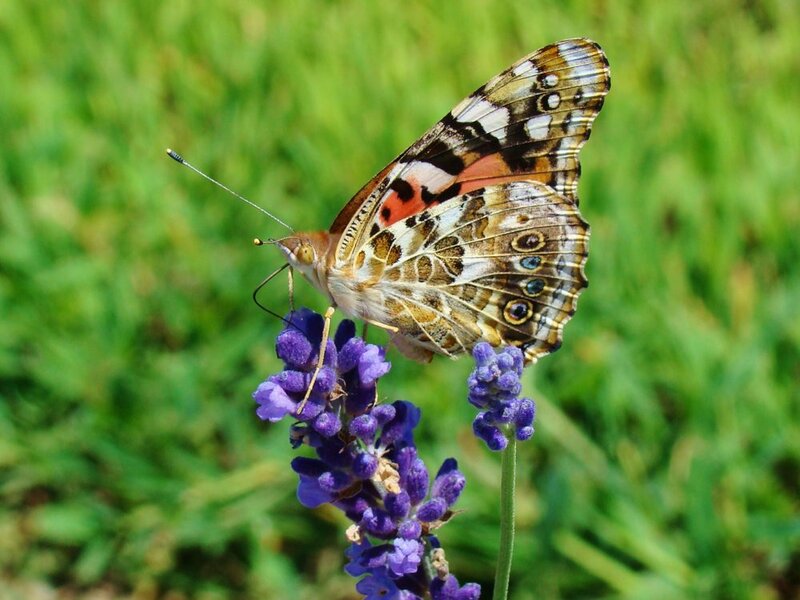 We had our annual Month of the Butterfly Photo contest. We host a facebook vote to determine the best in show and the Lavender Lady pics out some of her favorites. We really had some great photos this year. here are some pictures of the finalists. Check out our facebook page to see all the photos. It has been a real come-back year for us at the farm. The new phenomenal lavender is exploding and the our weeding machinery is making things easy on the back. There are still plenty of blooming plants to be cut. Come on out and cut some fresh lavender. Enjoy the field and relax. It has been very rough the last couple years. I don't think we have had but 20 plants survive the past two winters. We planted the first of our plants in 2009. And we really have never had much of a problem with the plants not surviving the winter. That all changed over the last couple years. Winter of '13-'14 was extremely cold. I expect most of our plant death that winter was caused by extreme temperatures. We replaced our plant stock, the majority of it was replaced with a new varietal of lavender that was reported to be much more hearty and able to survive winters in Maine and Michigan. We planted several thousand of the phenomenal varietal in the summer of 2014. We also did some additional experimentation with row covers for the winter of '14-'15. None of our phenomenal plants survived. We had our soil checked by Iowa State University labs and had some extensive conversations with the supplier of the phenomenal lavender. We are still uncertain what caused the problems last year, but we are very happy with how the plants seem to be looking coming out of the winter. There is significant amounts of green in all the plants and if we continue to have a warm spring, we are hoping for an early bloom. keep your fingers crossed!! We had our first Lavender Festival this summer. We are calling it LavenderStock. We wanted to start small and make this a learning year, so we didn't advertise about it much. We had several additional vendors and free samplings of multiple lavender foods (fudge, lemonade, cookies, popcorn). Many of our artists were on site to talk about and show their work. We have big plans for the future of our festival. We will have it in Mid-July each year and will be sending out a great deal of information on our plans well before the event. We hope you pencil us into your schedules and join us for our festival each year. We are at the Omaha Home and Garden Show this week. Its always fun to meet some new Friends of the Farm. This is the first show where we are offering free cookies for all of our Friends of the Farm that have the pass phrase. We are keeping it simple with our first show. In order to get a free lavender sugar cookie you need to speak the word lavender and then give me and all knowing nod. I have a limited supply and am in danger of running out with the traffic we expect on the weekend. Hope you can come by, stock up, and walk away with a free cookie. We have all of our bath and skin care products as well as a few choice crafts from our artisans. I look forward to meeting some new Friends of the Farm this weekend. We have several months until we open for the summer. In the mean time, our spring show schedule is filling up. This is what we have scheduled so far. We hope to see you when we come through your area. Looking forward to a great spring show season. Look for our secret pass phrases. We will have cookies at our shows, but only for the true "friends of the farm" that know the pass phrase. In the past we have relied on the heartiness of our lavender to allow it to survive through the winter. Well, last winter a very long stretch of weather below 0 degrees F killed 95% of our lavender. This year we are doing some experimenting. I have done significant research on row covers and we are using row covers on 90% of our plants. Row covers should keep the soil temperature approximately 15 degrees higher than uncovered areas. I am very confident this will ensure the full survival of our plants through the winter also, I expect they will bloom earlier and fuller in the spring. We will compare our covered plants to the uncovered plants. We will also uncover some plants earlier in the spring to see how we should handle the spring. We will keep you all posted on our results. For those of you with plants at home. Make sure all of your potted lavender is inside by this time of year. The root balls on potted plants do not get the temperature moderation that ground plants get. I would keep your potted lavender inside until mid-April. "On behalf of its member utilities, IADG honors distinguished Iowa companies and entrepreneurs with the Iowa Venture Award. This award recognizes outstanding businesses for providing leadership, capital investment, and employment opportunities for rural Iowa. Nominations are solicited annually from IADG sponsors." It is humbling to be recognized in this way and even more humbling that we get so much positive feedback from our customers, or Friends of the Farm. We are trying to figure out where we are going to put the award. It is quite substantial in size and weight. I think we will find a good spot for it. A busy day of Shopping Small. Small Business Saturday was extremely busy this year. By far our best Small Business Saturday since we opened. I really appreciate all of your support and I think those that were able to make it out were able to find something special for the gift giving season. As usual, I enjoyed having a bunch of people out at the farm. I feel very blessed that everyone has so many good things to say about the farm. We love seeing familiar faces and meeting new friends of the farm. We do not have plans for regular business hours for the rest of the Christmas Shopping season. However, if you would like to browse the shop I am always willing to open the shop if we are home. Please call at 712-642-9016 before you come out to make sure we will be available to open the shop. We will be in Council Bluffs at the Mid America Center next weekend. If you are unable to come out to the shop, you can see us there. You can also order some of our lavender bath and skin care products on-line, or if you want something special from the shop, you can call to place that order. Friday and Saturday we will be in Sioux Falls, SD for the Sioux Empire art and craft show. We will be there to share our full line of bath and skin care products. It is a great place to do some shopping for unique Christmas gifts. We hope you are able to come out and see us and chat about the farm for a minute. See you there! Glad we posted regarding our trip to Southern Hills Mall in Sioux City. Those of you who follow our facebook kept it interesting last weekend. We didn't have very many visitors, it was a bit of a disappointment. Thank you to all who dropped by, I hope we made it easier to stock up on LHLF bath and skin care supplies. We have a few more coming up. we will be in Ankeny, IA at Santa's N. Pole Fair. We will be at one of the following locations. We were happy to host a wedding last weekend. This is something very new to us and we are starting slow by hosting weddings of friends and family. We were very happy to host this big day, with a military groom and a tough deployment schedule, the young couple had limited options. We believe everyone had a great time at the wedding. We pray that this new home will be filled with laughter and the pride that accompanies service in the armed forces. We have our Pergola mostly finished. We are hosting a fall wedding. When building the Pergola, we were hopping young couples would see it as a wonderful place to perform their vows. Right now, we are not prepared to host weddings for the general public, these are friends and family events. You could say we are experimenting with friends and family on weddings. The wedding we are having next week has agreed to let us use pictures. We are looking forward to hosting weddings next year.